Dentist in Sorrento Valley, CA | Meet Dr. Vivien Chadkewicz, D.M.D. 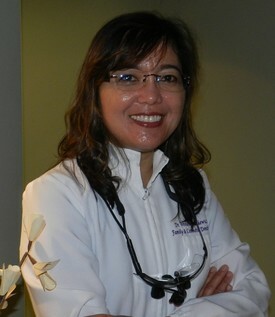 "Dentistry and caring for people have been my passions for nearly three decades. I get a tremendous feeling of satisfaction by improving the oral health of my patients and by providing them with genuine, quality dental care. It is a goal of mine to provide each patient with the utmost respect and best care available. I treat my patient’s the same way I would treat my own family. Every year I attend Continuing Education seminars to enhance my knowledge and skills so my patients will continue to receive the most up-to-date care and state-of-the-art technology on the market." Dr. Chadkewicz has been practicing dentistry since 1989 and since 2001 in California, when she became accredited by the California Dental Board. Although not always practicing in San Diego, her goal in dentistry has never changed: to provide the best quality dental care to all of her patients in a caring and friendly environment. Since moving to San Diego in 2002, she associated with a local General Dentist for a short time before purchasing her current practice in 2005 and has not looked back since! The Doctor’s vision quickly took off to create a Family and Cosmetic dental practice that takes care of the entire family’s needs, not just certain ones; and that’s exactly the way it should be! Since opening her practice, Dr. Chadkewicz has continued to provide exceptional dental care to all of her patients in a family environment by giving individualized attention to each person in her care. When you come to our office, you’re not just a number, you’re family. Make your appointment today to join our family! No need to click away from this page! We've made it very easy for you to schedule that first appointment! Either call us at (858) 646-0676 or click to schedule an appointment today!